This is JUST a way to get you started if you're going to, for example, be on the road, and don't want to send your sound engineer something so TOTALLY different from your other mic that they start wondering if their headphones have gone bad. Okay, so that said, there's several ways to match the sound of one mic to another, but TODAY, we are going to go for "quick, cheap and dirty." Also, for this process, We're going to assume that MIC2 is the lower-quality travel mic. You DO NOT adjust your nice mic to mimic your cheapie. In Windows, ASIO4ALL and/or VoiceMeeter can both help you here. They are virtual interface control panels for sound devices, and you can create different channels. Simply install one or the other, set up the devices in the panel, then select your multi-channel devices so that you can record from both of your mics simultaneously. Go to Audacity's Preferences panel, and select your recording source, set up multi-channel recording with your mics each as a channel. 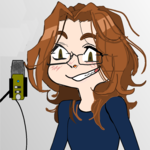 Choose ASIO4ALL (Or VoiceMeeter) as your recording device in Audacity. Now that you're set up for recording both mics, you'll want to set them up next to each other, within a few inches, as you normally would record. Leave enough space so that they don't interfere with each other, but make it so that when you aim your voice at them, you are pretty much talking into both of them equally, and with proper mic technique. Select the entirety of the Mic 1 file, and then go to "Analyze" >> "Plot Spectrum"
Wow. That looks... daunting eh? Not to worry. It's just a visual representation of the amount of sound in each of the different Hz ranges of your voice. In other words, when you compare the two, you can spot the differences, and create an EQ pattern to make one match the other. Make a note of the values of the plot where your dB axis and Hz axis meet. Write these values down. You can then do the same for Mic 2. NOTE: The plot markers shift based on the height of the highest peak so KEEP AN EYE ON YOUR NUMBERS and ignore the general shape of the graph. 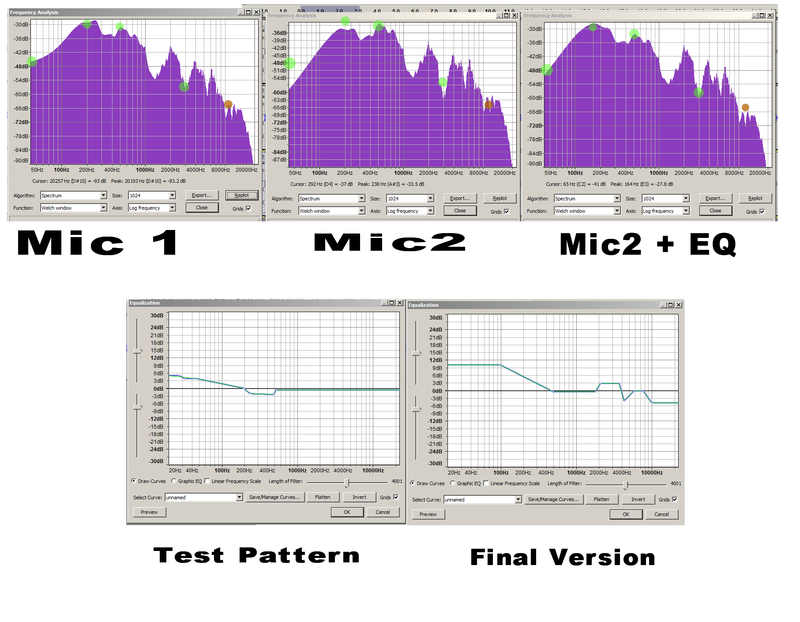 Your goal is to adjust the EQ so that the plot of Mic2 more or less hits the same amplitude on the chart as Mic1. You can see where the green circles correspond on graph 1 and 3, but on the un-altered mic2, they're missing the mark. NOTE: This is a VERY SIMPLIFIED VERSION of the process. It's not going to make Mic2 sound EXACTLY like Mic 1, just much, much closer. You can further improve the sound by making minor adjustments, making the EQ pattern more complex, and using tools like dynamic range compression and the like to ensure that your travel mic sounds like your main mic. Ultimately, this give you sort of a "starting place" and a good understanding of how and why one mic sounds different from the other and what you can do to fix (or alleviate) it. Go easy on it, be careful with it, and if you develop a decent ear for what you're doing you can get the most out of your mic!